Have you thought of your home as a cozy place? For the longest time I didn’t but now I do. Here are the several ways I make my home cozy. Candles - My husband is the one who taught me how to enjoy scented candles. I didn’t grow up with this habit, plus I am sensitive to smells, but his appreciation for candles have won me over the years. We now have found our favorite smells and we have seasonal scents we enjoy. This time of year, we light pumpkin scented candles. Recently, I took one of my kids candle shopping. I quickly noticed that our likes differ. I was wooed by her comment as she smelled a “fresh cut gardenia” candle. She said “this smell makes me smile.” I thought, we must have this candle! Candles soothe our sense of smell when we are at home. Our family is immediately delighted as they walk into a room and they are greeted by familiar fragrances we made our own. Flowers - I love fresh flowers. I make the point to keep them around because they add great beauty to the eyes and they enhance my home. I learned to make the point to grab a beautiful bouquet from the grocery store. I have been buying lilies for the past month of so, and I love how they open up so beautifully as I put them in a vase. It reminds me of my family’s spirits. They are open to my influence and I hope to be a positive one, always. We are blessed to have roses in our yard and having flowers in our home gives us the extra reminder of the beauty God created. It makes us all happy. Homemade food - So many of my childhood memories are attached to homemade food. My mother cooked every day and I hope to provide the same nurture for my kids. Our staples are rice and black beans. I also cook some of the same foods for breakfast such as oatmeal and breakfast casserole. As the kids grow up, they are letting me know which foods are their favorites. I adjust as needed but I also know that I am setting a foundation. My hope is that they will know what real food tastes like so they can make good choices for themselves. Homemade food is an experience. As I choose to keep cooking, the kids can see me washing black beans, putting them in the pressure cooker and seasoning them with sauteed garlic and onions. As those homemade dishes travel from the stove to the table, I hope the kids feel the love and honor that I feel as I care for my family. I haven’t always felt that way. I remember being often surprised that I had to feed people (I know... crazy but real). Motherhood really helped to awaken me to this part of my life. Mothers nourish in different ways and food is one of them. Family dinners - We love family dinners at our home. We try to have family dinners most nights of the week. I think that every time we sit together to share a meal, we count it as family dinner. The goal is to thank God for the food and enjoy a meal together. Beyond eating, I find there are so many teaching moments during family dinners. We also share memories of long ago. The kids are eager to ask questions about our past. They will often ask my husband to tell them a story from his childhood.We listen, we laugh and we find that as we get up, we our souls are fed and we are ready to face life. I can’t say that we sit together 7 nights a week because that’s not realistic for us. I do pay attention to the times we’re all at home and I make sure that the table is set and the environment is right for this connection to happen. Enjoying the backyard - We are so blessed to have a backyard. The weather in south Texas also allows us to enjoy it year round. We pick lemons from our tree together. The kids play a lot outside and while my husband and I sit there and talk. We all enjoying the roses and we have attempted to camp in our backyard. I do think that part of having a cozy home involves the things that are outside. When we were in North Carolina we enjoyed our front porch because there was a vegetable garden in the back. The key is to enjoy the home in its entirety. 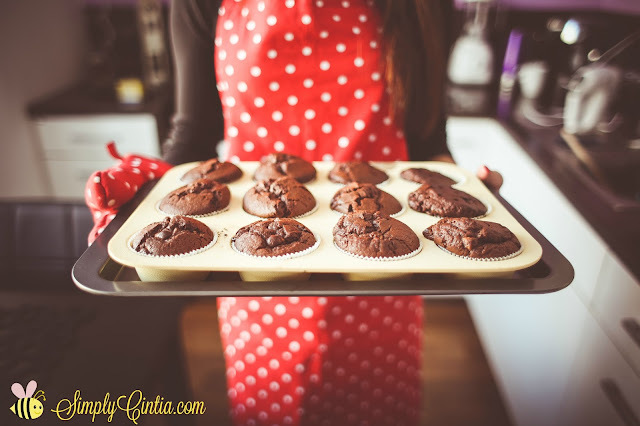 Baked goods - I enjoy baking muffins and that experience also contributes to having a cozy home. Nothing can compare to the smell of fresh baked goods! They’re also better for our health simply because I know every ingredient that went into making the pastries. The kids often help me to mix the dough. Every new ingredient added is so exciting to them! Serving the final product is also a great experience. We often sit at our kitchen table to eat those muffins but never without a cup of herbal tea. We try to bake around the time we have guests. We hope our guests will feel extra welcome because we did think about them as we baked. I have also displayed my baked goods to stage our house. I don’t do this often because baked goods do not last long around here! Allowing family to use our home - One of my friends told me that she keeps her home clean and on the weekends she allows her family to enjoy the home. When Monday comes, she slowly puts everything back in order. I have since made peace with the fact that I have to allow my children to use and enjoy our home too. The house is also theirs, and while I don’t want playdoh in the ceiling, I do want them to feel free to enjoy the house. I had to remind myself that this is not a museum but that memories are being made here. Verbal welcome home with a hug - Most of my kids are school age so they spend quite a bit of time in school. I have learned to verbally and physically welcome them to our home. I say “welcome home” and I give them a hug. I believe that this transition helps them know that this is the safe place where they are loved and cherished. I tell them I missed them (because I do) and I rejoice in the fact that we are all together again. I don’t know if you realize but I just appealed to the 5 senses to make my home cozy. I also realized that I can use this formula and still not get it right if my heart is in turmoil. Being at peace with God and having this kind of peace fill my heart is the most effective way to make any home cozy. Cultivating a relationship with Jesus, the Prince of Peace, and practicing stress management once I close my prayers, has been an effective way to pursue peace. When I became a mother, no one told me I was supposed to have a cozy home. This was provided for me, although I was oblivious to it - and yes, I’m very thankful! I am always trying to find ways to be sure that our home really is a great place to be, any day of the week. If all of these methods fail (cause seriously, if there are no flowers and I don’t feel like baking, it doesn’t mean our home can’t be cozy), I know that the peace of God and the fellowship of the Holy Spirit will be evident in the way I care for my family. That is the prayer of my heart friends.